Module uses: automotive circuit modification, industrial equipment, experimental testing, circuit application testing. 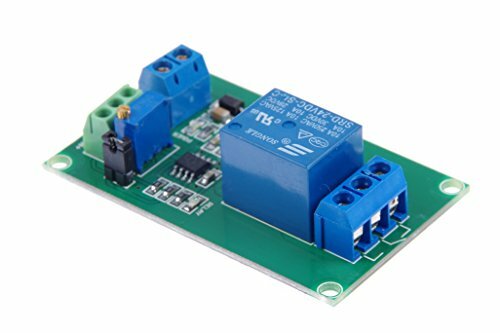 When the input voltage is less than the reference voltage, the relay is disconnected and the circuit is disconnected. When the voltage signal A is smaller than the voltage signal B, the relay is opened and the circuit is disconnected. Note: Function 2 requires that the jumper cap of the corresponding channel be unplugged. Contrary to function 1, disconnect the jumper cap shown in the diagram and short-circuit the back contact in the diagram. When the input voltage is greater than the reference voltage, the relay is disconnected and the circuit is disconnected. The reference voltage of the module is the input voltage after multi-turn precision potentiometer partial pressure obtained, the input voltage value determines the range of reference voltage value. For example, the input voltage is 12V, then the reference voltage adjustable range is 0-12V. Channel difference is small, more accurate, 0.1V resolution accuracy. There are three versions of 5V / 12V / 24V optional. Input a voltage compared with the reference voltage (reference voltage through precision multi-turn potentiometer partial pressure get),the input voltage is greater than the reference voltage, the relay pull, the circuit connected, at the same time the work of the corresponding channel indicator light. Input a voltage compared with the reference voltage (reference voltage through precision multi-turn potentiometer partial pressure get), the input voltage is less than the reference voltage, the relay pulls, the circuit is connected, at the same time the work of the corresponding channel indicator light. Input voltage (A and B) between the comparison, the voltage A is greater than the voltage B, the circuit is turned on, while the corresponding channel work indicator light.